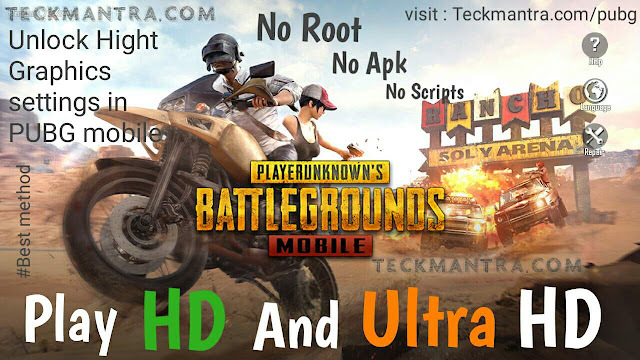 Now play PUBG mobile in HD and Ultra HD on such Android phone where no Options in Games Graphics settings to Do it. Here I'm going to Show How to play Player unknown battle Ground in HD and Ultra HD without Root and without any codes. It's time to increase the Resolution and Fps in PUBG mobile with just by a simple steps. I.e just by two click. 100 players parachute onto a remote 8x8 km island for a winner-takes-all showdown. Players have to find and scavenge their own weapons, vehicles and supplies, and defeat every player in a graphically and tactically rich battleground that forces players into a shrinking play zone. Get ready to land, loot, and do whatever it takes to survive and be the last man standing. The powerful Unreal Engine 4 creates a jaw-dropping visual experience with rich detail, realistic game play effects and a massive HD map for Battle Royal. Feel like you’re in the thick of the action as you play with high-quality audio, immersing 3D sound effects and 7.1 channel surround sound. A constantly growing lethal arsenal of firearms, melee weapons, and throw ables with realistic ballistics and travel trajectories gives you the option to shoot, beat down, or incinerate your adversaries. Oh, and you like the pan? Not Just A Game. This Is Battle Royal. Some Device by default set on Normal graphics, and have no Options for HD or more. 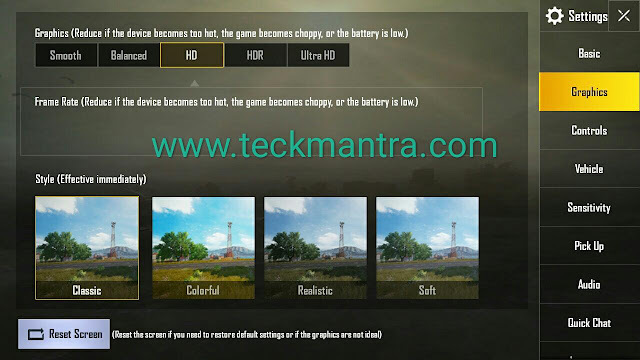 Here the Tricks by which you can play the PUBG mobile on HD or Ulta HD even without eligible options form graphics settings. Attention : This method doesn't contain any type of Hack or script inside/outside the game. This setup is not using any type of Hacking or cracking with pubg mobile. Do not worry About any type of Ban. 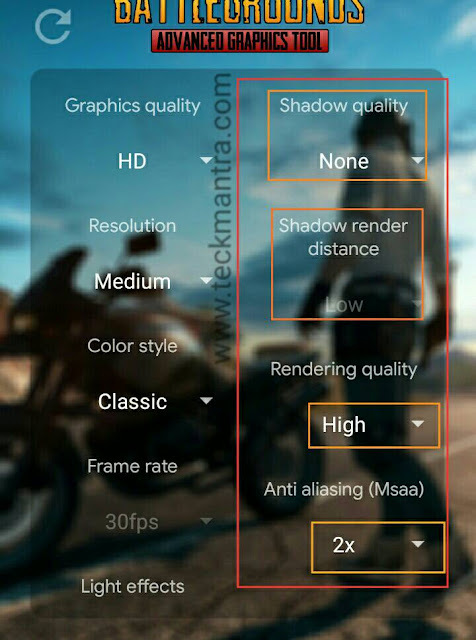 You need to set up one time Apk for HD or Ultra HD Graphic settings, after that the game are using more resource from your phone including RAM and processing power. Attention : in Some low class Devices it may cause for Heating of mobile, we recommend use HD graphics Not go for Ultra HD. Need to keep Apk in Your Device : Once setup is Done, No. You can Uninstall the Apk Once the setup complete. Ranging from mid range to flagship phones, this is the perfect tool for better gaming experience. ● If you changed ANYTHING in the in-game graphics settings, please close the game and re-apply your setting from BAGT before playing. Make sure to allow Storage permission or else the app would fail to do its work. Tip : Set the Graphics and Fps option according to your Device Hardware to skip the Heating inside the Device. Here I'm Not going for Ultra HD Because in my case, the Phones Display quality is Not so Good. 3. Click on Apply and Launch the Game. That's All. 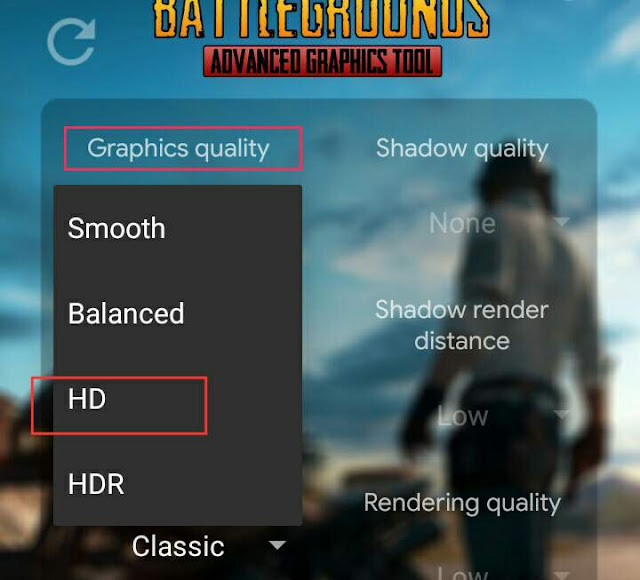 in your Device the PUBG mobile automatically takes HD or Ultra HD Graphic settings. You can also check it >Settings> Graphic. After the setup You can uninstall the Apk from Your Device. Your graphics will Not loos on doing this. GRAPHICS QUALITY : The quality of the graphics in general, if you're wondering why Shadows are disabled on the Smooth setting. That's because the game actually doesn't support Shadows on that particular option to keep up Smoothness. 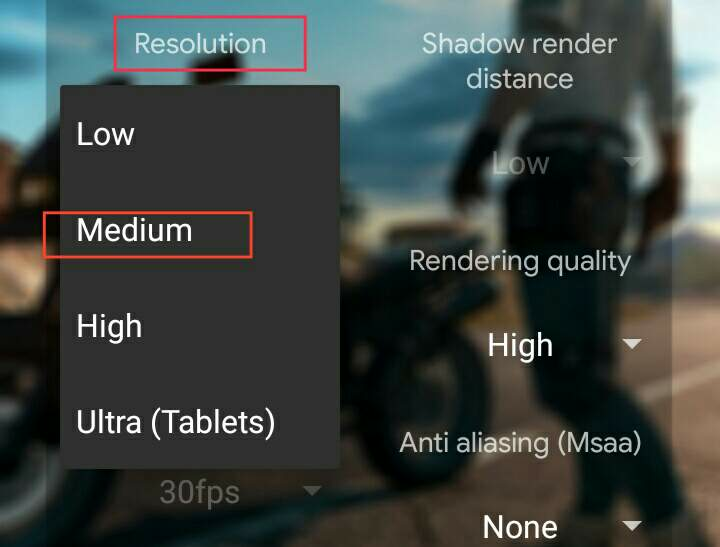 RESOLUTION : This resolution means game resolution, not your screen's resolution. 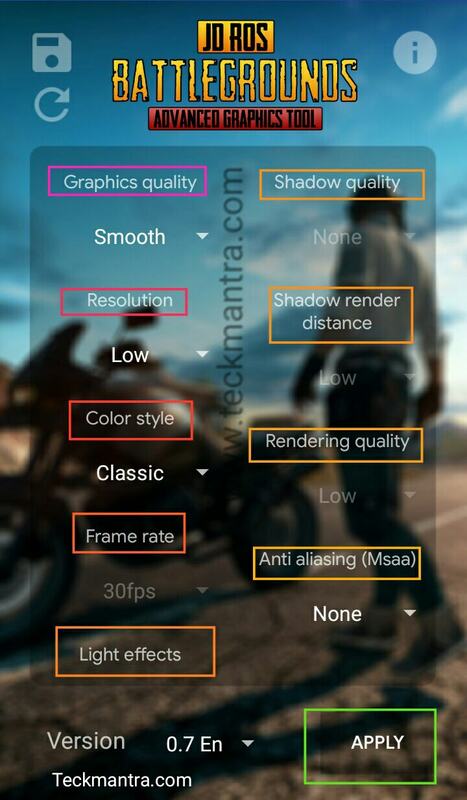 It doesn't matter what resolution your screen uses, you are free to choose which game resolution you'd want to use. Lower resolution gives you better performance but a little bit disadvantage on the game play. So I recommend only going down to Low resolution if and only if you have the potato est phone ever. Oh by the way, the Ultra resolution is only recommended for tablet users because that resolution makes the buttons a bit smaller than normal. COLOR STYLE : There are 4 color styles on PUBG Mobile and it really comes down to preference so I guess you just have to test them all. Be aware though that the Realistic color style requires a costs a little more performance than the other 3 color styles. 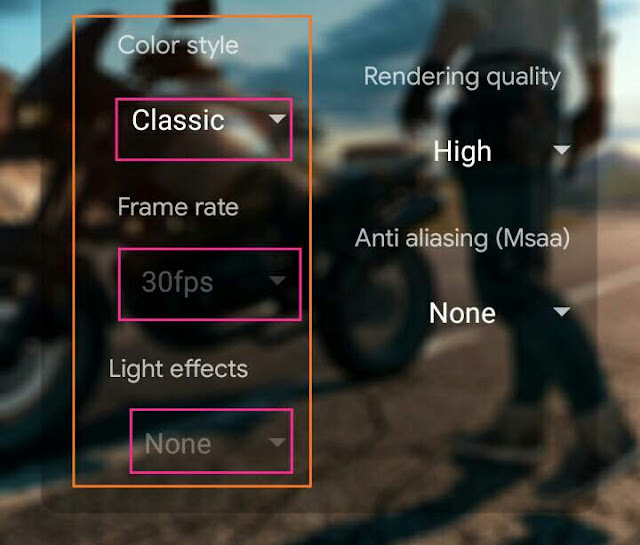 FRME RATE : You might be wondering, why put a 30fps option if everyone will choose the 60fps option anyway. Well, not all phones are capable of running in 60fps because it's too weak. So you might wanna stick to lower fps if your phone can't handle it, it's gonna save you some battery, trust me. LIGHT EFFECTS : i only recommend turning this on for aesthetic purposes and if you have a pretty good phone, because truthfully it has no game play advantage but costs performance so better turn this off if you have a weak phone. Be aware though that some devices do not support LightFX on PUBG Mobile. SHADOW QUALITY : You can change the crispness of the shadow here, but at a performance cost. I recommend turning this off so you could see enemies better ,they can't hide in the shadows if there aren't any right? SHADOW RENDER DISTANCE : Wanna see the shadow from afar? Turn this option up, but keep in mind that this option requires a lot of power. I recommend going Medium if you only turned this on for Aesthetic purposes. RENDERING QUALITY : This option also requires a bit more power if you went High but it will make the shades and textures give a little bit better. I recommend Medium if you wanna use shadows on Mid range phones. ANTI-ALIASING (MSAA) : Make sure NOT to turn on Force 4x Msaa on Developer options because that option is basically the same as this one. So what is this option? Turning this on will make the edges smoother. I recommend 4x for competitiveness but it might cost performance. Might as well go with 2x if you have a mid range phone. That's All ENJOY the PUBG at High quality of Graphics. Text in "more About Setup" from BAGT apk.